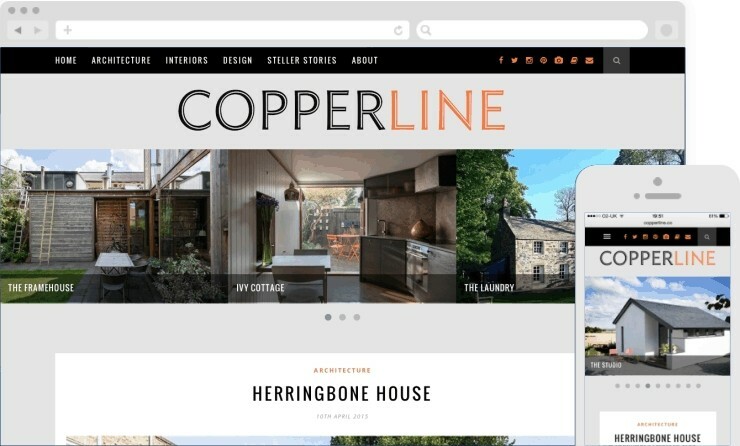 Designed by 286blue, the Copperline website won “Best Designed Blog” at the 2015 Amara Interior Blog Awards. Freelance interiors and property journalist Fiona Reid had two Tumblr blogs but needed a stylish website to consolidate and frame her articles on architecture and design. 286Blue transferred all the articles and images from the two Tumblr blogs into one bespoke site that accurately reflects the aesthetics of the stylish interiors featured. Creating graphics and branding icons for the new build, and using a simple palette of greys, black, white, and a touch of orange to reflect the name, Copperline.co provides an elegant and responsive platform that looks great on desktops, tablets, and smartphones.